Moonshine is one of the best opportunities on the market. 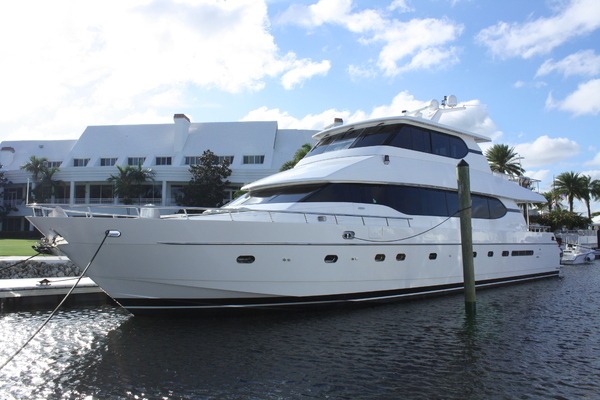 She is a two owner boat and both owner's dedication reflects to her condition. 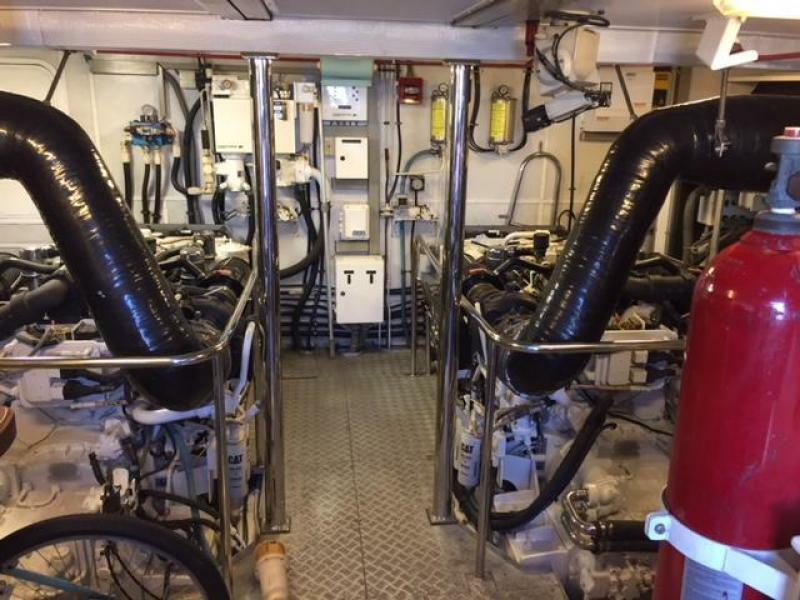 She offers a great layout with crew forward allowing plenty of space for the engine room aft making it easy to service her CAT 3412's and Northern Lights generators. 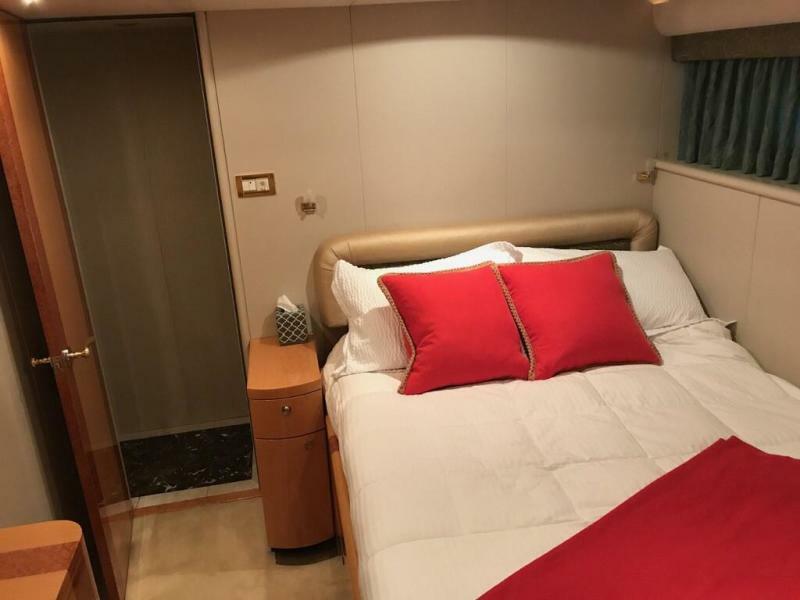 This layout is an owner operator's dream as the forward crew can be used as extra guest area with 2 additional staterooms and office. She is US duty paid and available for all buyer's. Moonshine is ready for viewing in beautiful and historic downtown Charleston, SC. 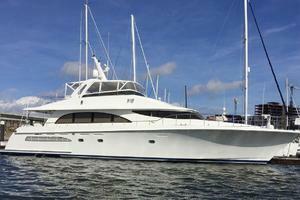 United Yacht Sales New Jersey would love to guide you through a personal showing of this 81' Cheoy Lee Bravo 2001. 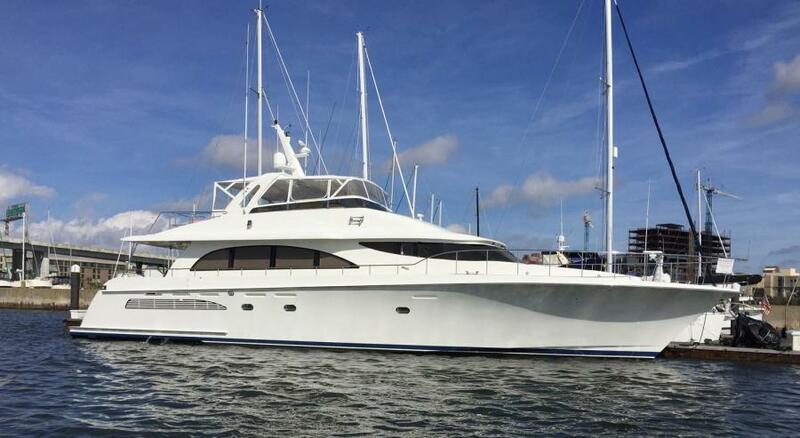 This yacht for sale is located in Charleston, South Carolina and priced at $1,490,000. For a showing please contact us by filling out the form on this page and we will get back to you shortly! Moonshine is one of the best opportunities on the market. 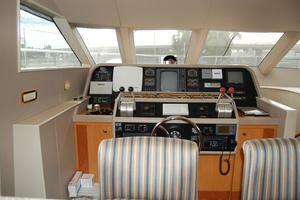 She is a two owner boat and the owner's dedication reflects to her condition. 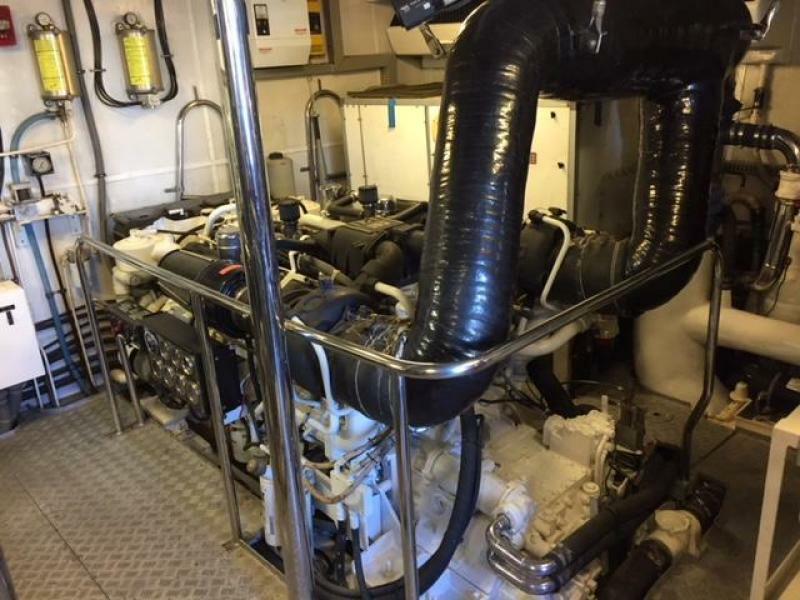 She offers a great layout with crew forward allowing plenty of space for the engine room aft making it easy to service her CAT 3412's and Northern Lights generators. 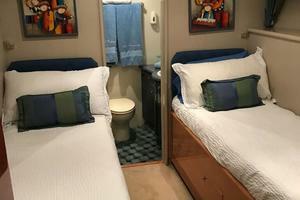 This layout is an owner operator's dream as the forward crew can be used as extra guest area with 2 additional staterooms and office. She is US duty paid and available for all buyer's. Moonshine is ready for viewing in beautiful and historic downtown Charleston, SC. Forward of the main salon is the dining area with a free standing solid cherry wood table with seating for eight. 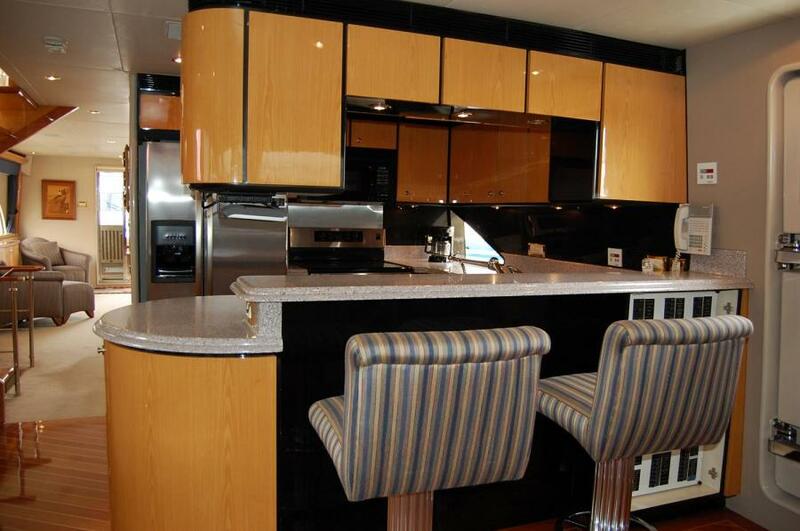 There is a built in buffet for storage with a black granite top accented by two pillars and a mirrored accent panel. 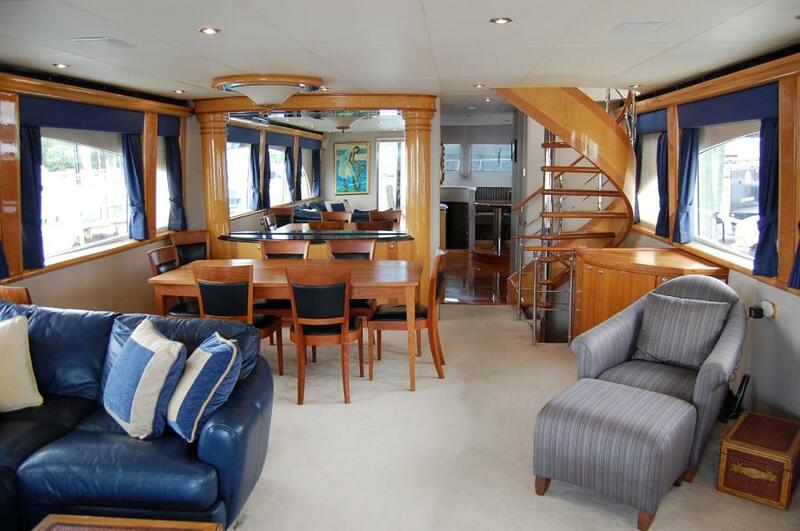 To the starboard side, just forward of the dining area is a wood spiral stairway leading up to the flybridge and down to the master and two guest staterooms. 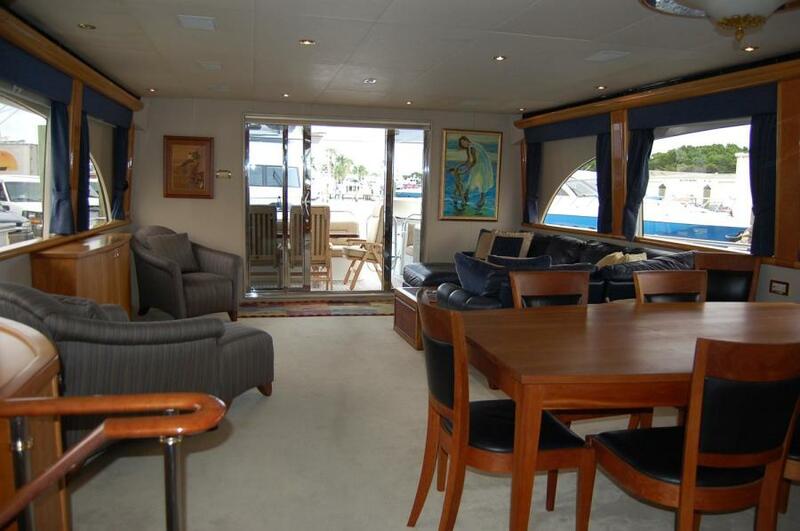 Forward on the main deck is the large open country galley with a bar height eat in countertop and two bar stools. 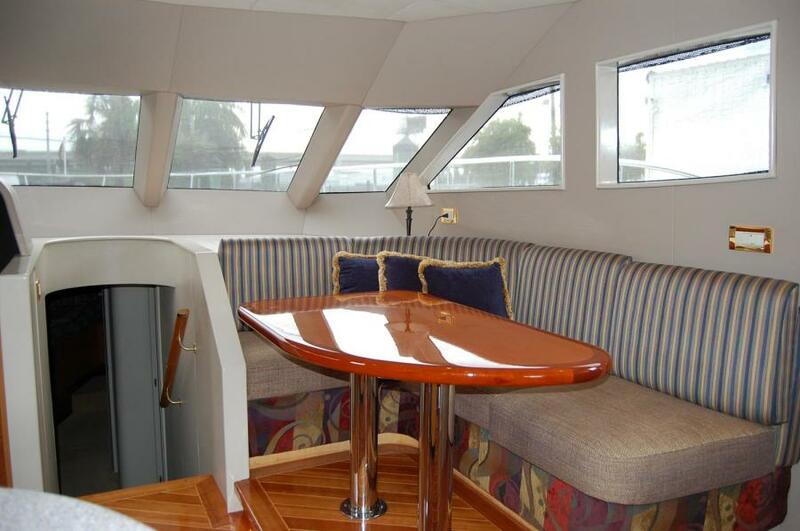 To the starboard is a country dining area with built in upholstered L-shaped seating and storage underneath. The sole is solid teak & holly. The cabinets are a cherry wood and the countertops Corian. There is a lot of natural light through the forward windshield and surrounding windows. A small folding flat screen TV mounted under the cabinet lets the chef enjoy entertainment while preparing meals. 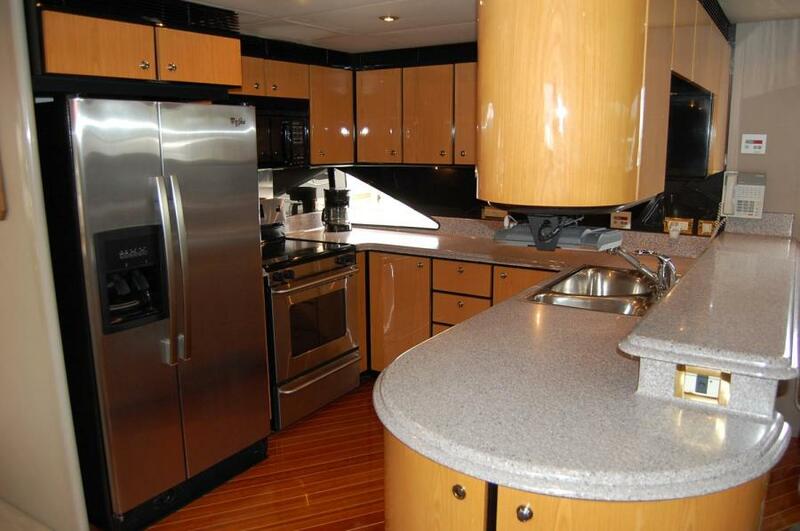 Full size stainless steel appliances make this galley as functional as your home. Just forward of the spiral stairs and opposite the galley on the main deck, is the day head with a cherry wood pocket door and a window for natural light. 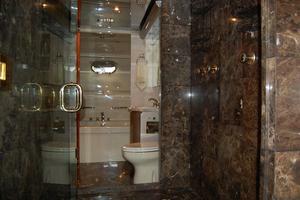 The granite countertop is complemented by the nickel plated sink and wallpaper. Granite sole with mother of pearl inlay. The head system is Galley Maid throughout. Ventilation fans in all heads. 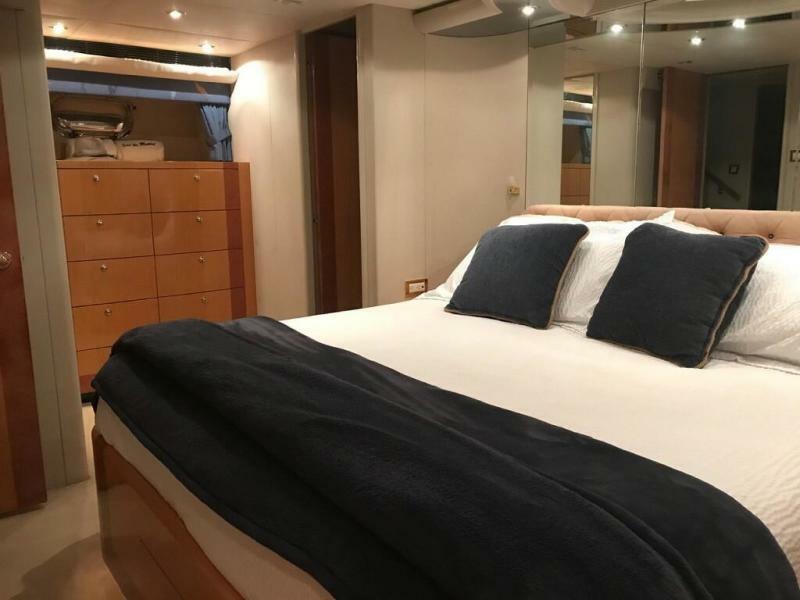 Following the stairs down from the dining area you will arrive at an elegant marble foyer with access to the master, VIP and twin guest staterooms. 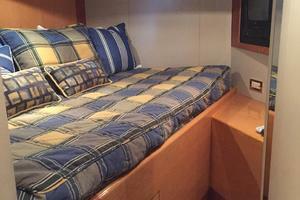 The master is full beam stateroom with a king size bed, mirrored headboard, fitted bed covers and accent pillows. Appointed with cherry wood and sapele inlay. This spacious master has plenty of storage in the cedar closets and drawers with a safe in the closet. 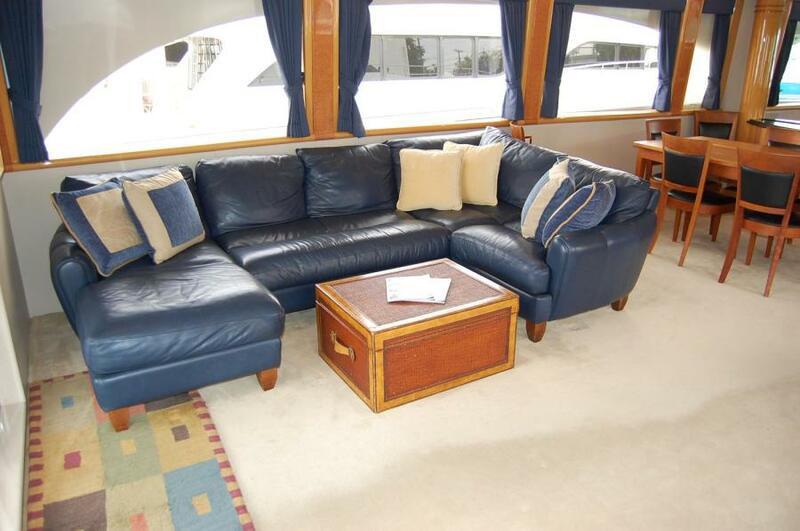 An upholstered settee with storage is to the port side. 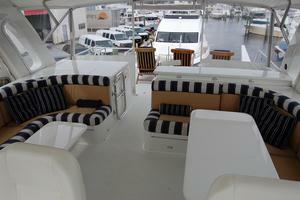 The forward bulkhead houses the television, stereo, receiver and DVD player. The master ensuite features a his & her head with a large luxurious marble walk through shower for two with double shower heads. 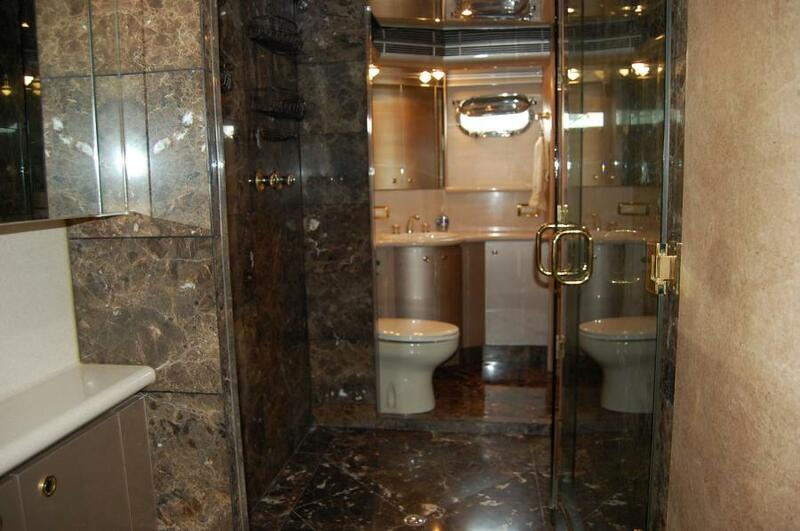 To the starboard is a jacuzzi tub. The floor is marble, the wall surface is in a light colored textured covering, ceiling is in Mitsubishi "A Look" with recessed lighting and ventilation fan. 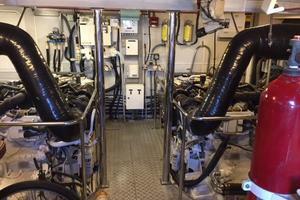 Emergency access out aft through the engine room. 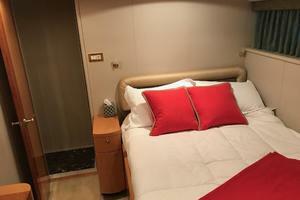 The portside VIP stateroom has a queen berth with a cherry night stand, custom bed covers, window treatments, valance. 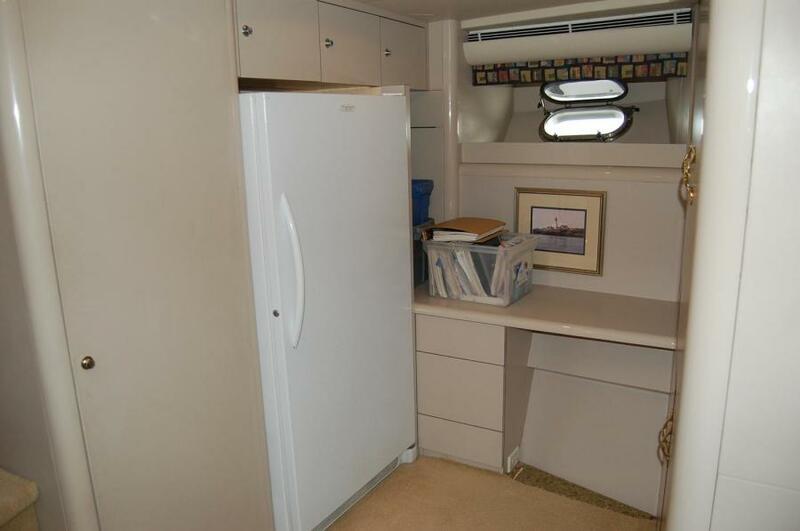 There is a large hanging closet with full length mirrored door, adjacent is a cherry corner cabinet, fabrica carpet, entertainment system 11" JVC with VCR combo, receiver, recessed overhead speakers, intercom telephone system. Satellite television. 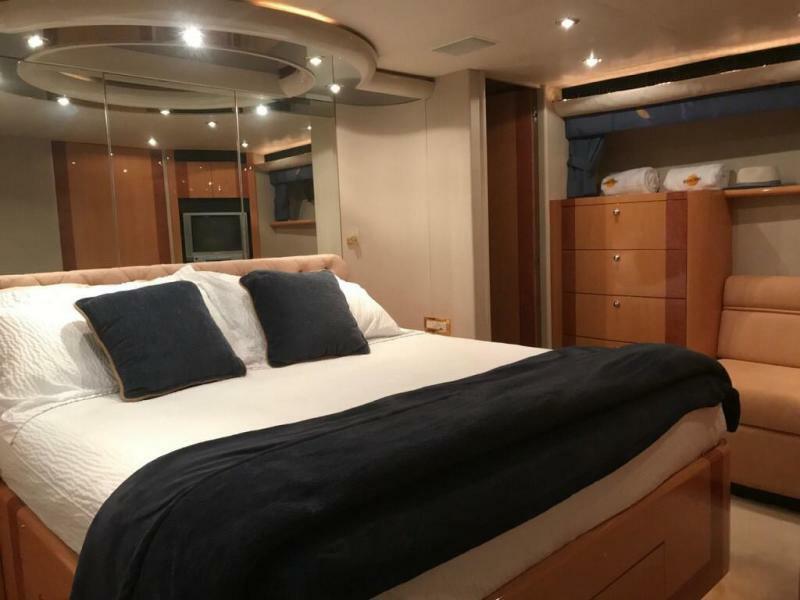 The VIP head is tastefully decorated with designer slate green stone sole, cherry wood, and avonite counter tops with recessed lighting, sink, vanity, shower, head and ventilation fan. Full size stall shower. 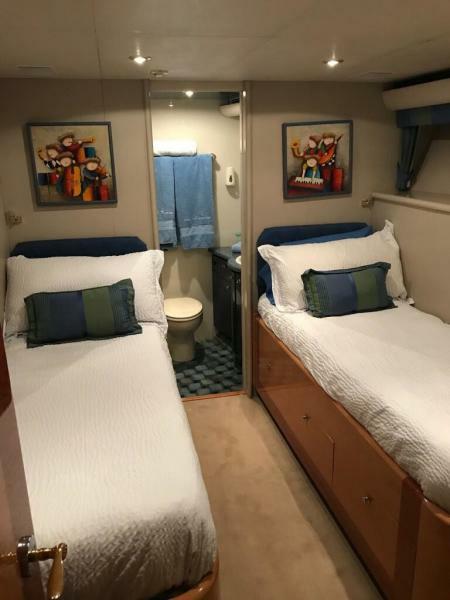 This guest stateroom features twin berths port and starboard, designer fabric bed spreads matching window treatments, valance, carpet, hanging closet, drawer storage. 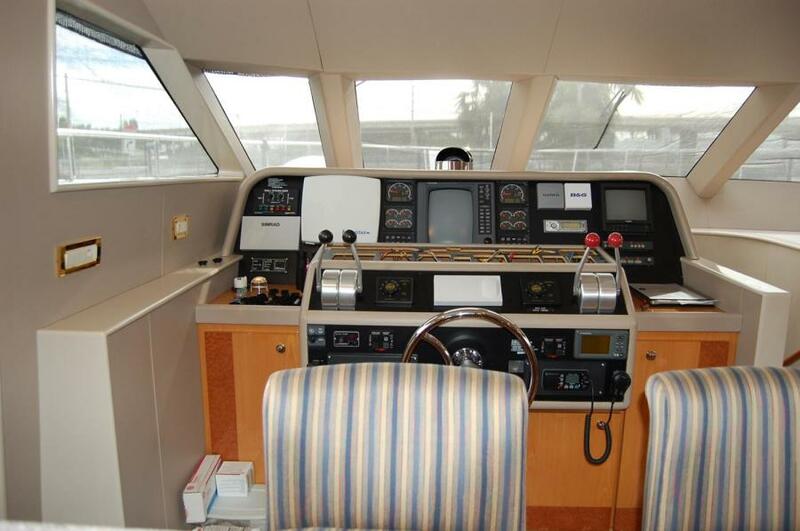 Entertainment consists of 11" JVC, VCR combo, with CD radio with recessed overhead speakers. Satellite television. 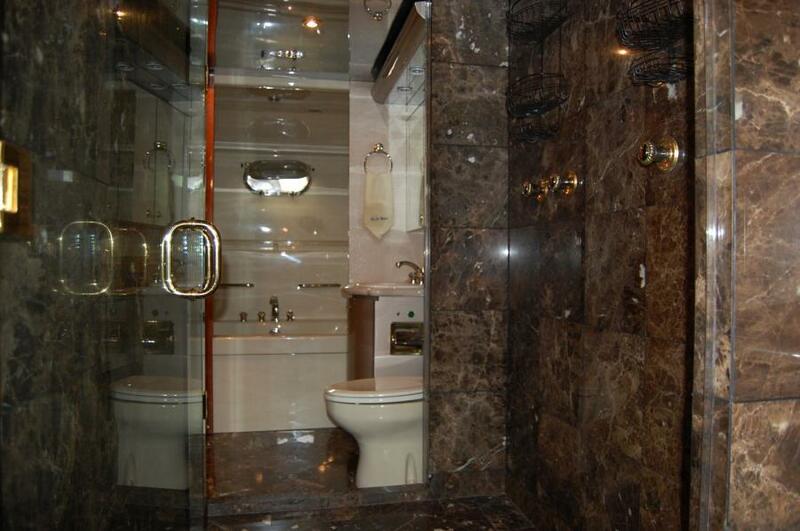 The guest head is tastefully decorated with blue designer stone sole, cherry wood and avonite counter tops with recessed lighting, sink, vanity storage, full size stall shower, head and ventilation fan. The forward centerline stairs lead down to the crew foyer area. 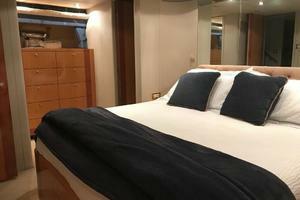 For owner operators this area gives 2 extra stateroom making this a 5 stateroom yacht. This area was customized with a 6 cabinet storage unit for pantry, cleaning supplies, spare parts, etc. A great asset to the boat! Another added feature to this area is the large brand new spare upright freezer. The washer and dryer is starboard to the freezer. 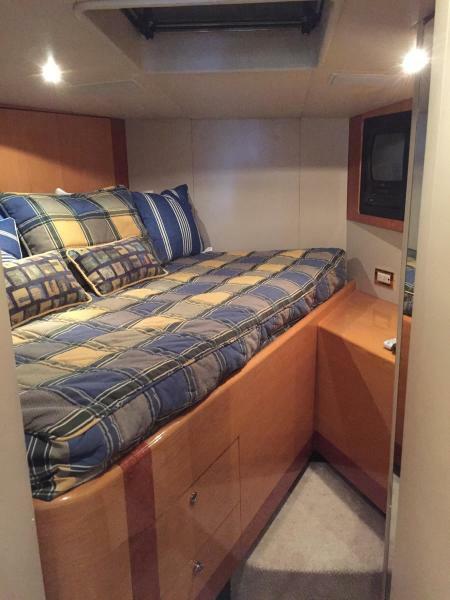 The forward cabin has a double berth, cherry wood cabinets for storage, private head, shower and sink, hanging locker with full length mirror on the door, JVC & VCR combo with built in speakers. Alpine audio system. The walls and ceiling are Majilite with recessed lighting. 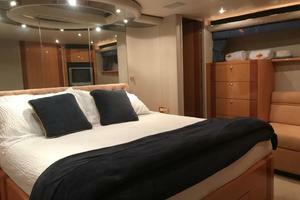 The forward head is private with a large stall shower, sink, vanity cabinet, storage below and drawers. 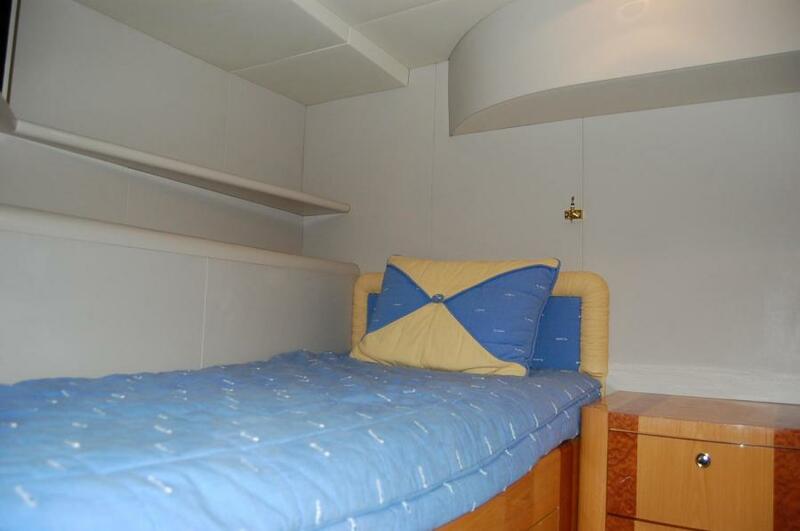 The ceiling has recessed lighting and ventilation fan. 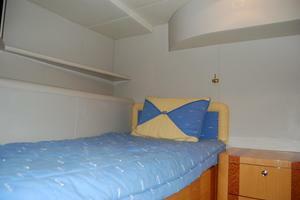 The crew/guest cabin to starboard has an upper and lower berth, cherry wood, private head, shower and sink. Hanging closet, drawer storage, and full length mirror, matching custom bed spreads, new carpeting and Majilite wall and ceiling coverings with recessed lighting. The ensuite head is private with a large stall shower, sink, vanity cabinet, storage below and drawers. The ceiling is in Mitsubishi "A Look" with recessed lighting and ventilation fan. Marble flooring. 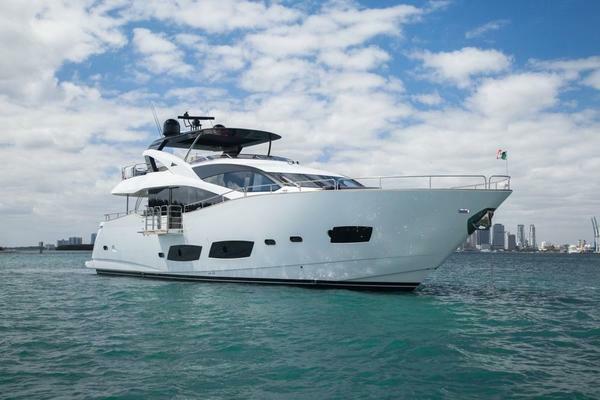 You can access the flybridge from either the aft deck or the interior spiral wood stairs. There are port and starboard L-shaped settees one with a fiberglass "coffee table" and one for dining. 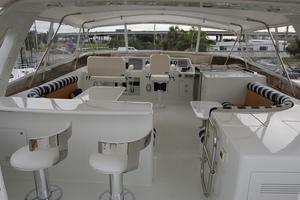 In addition there is a fiberglass bar top facing forwaard with 3 bar stools. There is a retractable Bimini top with full enclosure for the flybridge area. The cushions are blue and white all with new canvas covers. 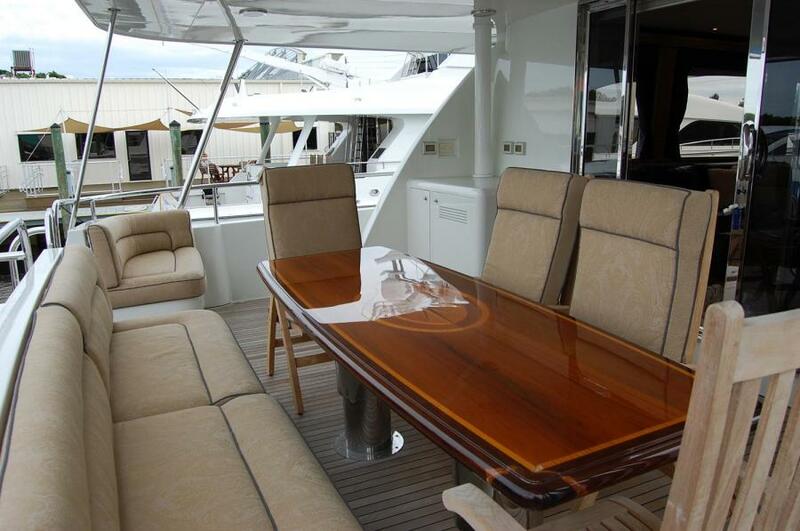 A lovely feature on the aft deck is the hi/low custom inlaid teak wood table. There is access to the flybridge via a ladder and hatch and a built in fiberglass cabinet for storage and a fridge. Camera, volume control for speakers, overhead lights, boarding gates (port & stbd. side). 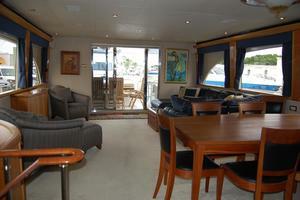 There is a glass sliding door leading to the salon and a hard top over the aft deck for alfresco dining. 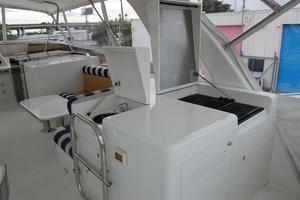 Access to port and starboard walk-around decks for ease of maintenance and line handling while docking. Swim platform access, with port and starboard storage or jet ski garages, is to the port side via molded stairs with teak treads. 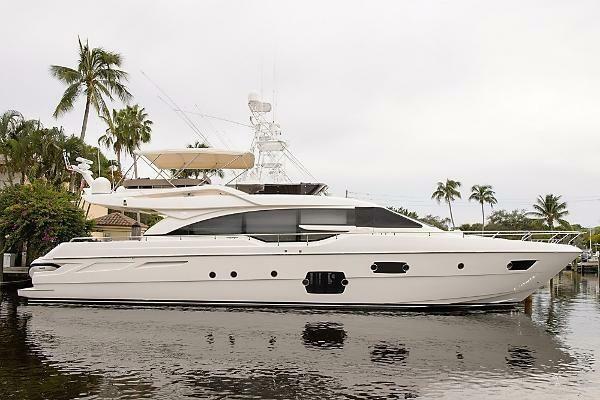 The hull, decks and superstructure are constructed of Divinycell cored fiberglass with integral double bottom fiberglass fuel, fresh water and holding tanks. 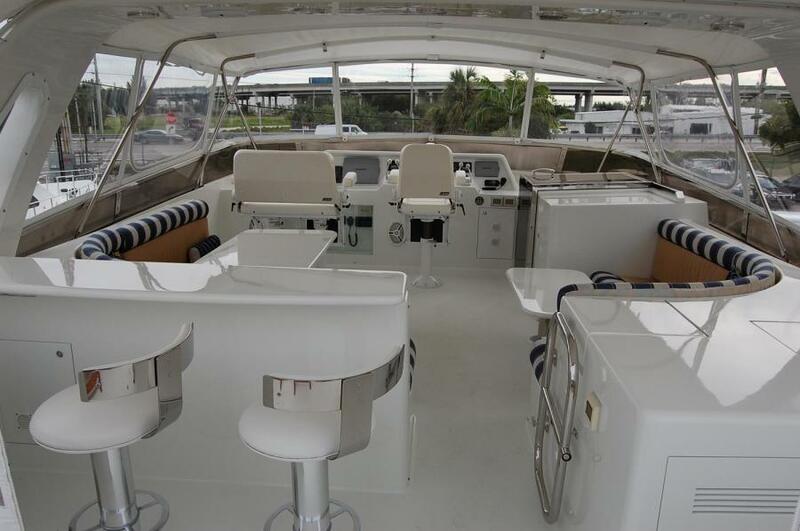 Fiberglass rub rail with stainless steel capping, Awlcraft 2000 off-white paint, Awlgrip non-skid exterior decks, Vinylester laminate and epoxy barrier on hull bottom. Walk-around decks port and stb'd. 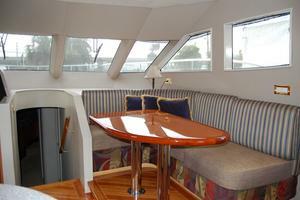 Fore-deck has a large sunpad. Vertical anchor windlass, Maxwell 24V DC 3500 lb 3/8" chain cathead and rope capstan, deck pipe and chain stopper. Chain wash down. Port dive and storage locker. Locker for shore power (100 amp on Glendenning), TV and telephone hook-up. 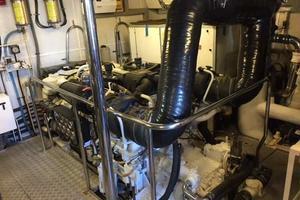 6 storage lockers on foredeck for lines and fenders. New canvas covers for all outside cushions.